The No. 13 Cal women did not have sophomore All-American Zsofi Susanyi for Saturday's match at No. 4 UCLA. Fortunately for the Bears, they did have Annie Goransson. With the match tied 3-3, Goransson outlasted Courtney Dolehide 1-6, 6-3, 6-4 to give Cal a split of their weekend series in Los Angeles. The Bears lost at No. 6 USC 6-1 on Friday. Goransson, a senior from Sweden, has won six of seven singles matches since returning to action this month. An undisclosed injury sidelined her for much of the winter. "For Annie, getting her groundstrokes back on track has been important," Cal coach Amanda Augustus said on calbears.com. "She's always been a great competitor. She played really smart and got inspired by the situation and the moment, which is what you want." Susanyi, ranked fourth nationally in singles and 23rd in doubles with Klara Fabikova, missed her second straight match. The reason was not disclosed. No. 13 Cal def. No. 4 UCLA 4-3 in Los Angeles. No. 1 singles: No. 3 Robin Anderson (UCLA) def. No. 6 Anett Schutting 7-5, 6-3. Team records: Cal 11-5 overall, 5-1 Pacific-12 Conference; UCLA 13-4, 4-2. No. 6 USC def. No. 14 Stanford 6-1 in Los Angeles. No. 1 singles: No. 2 Sabrina Santamaria (USC) def. No. 20 Nicole Gibbs 6-1, 6-4. Team records: USC 17-2 overall, 6-0 Pacific-12 Conference; Stanford 11-3, 5-1. Note: The Cardinal's seven-match winning streak ended. No. 43 Saint Mary's def. BYU 5-1 in Moraga. No. 1 singles: No. 17 Jenny Jullien (SM) def. Desiree Tan 6-1, 6-0. Team records: Saint Mary's 10-7 overall, 5-0 West Coast Conference; BYU 7-9, 1-4. USF def. No. 61 Loyola Marymount 5-2 in Los Angeles. No. 1 singles: No. 78 Andrea Ka (USF) def. April Bisharat 4-6, 7-6, 6-2. Team records: USF 11-6 overall, 2-3 West Coast Conference; Loyola Marymount 7-7, 0-2. No. 73 San Jose State def. Texas-Arlington 4-2 in San Marcos, Texas. No. 1 singles: Klaudia Boczova (SJS) def. Katar Dikosavljevic 6-0, 6-1. Team records: San Jose State 12-4 overall, 4-0 Western Athletic Conference; Texas-Arlington 4-9, 3-2. Note: The Spartans have a five-match winning streak. Pepperdine def. Santa Clara 6-1 in Malibu. No. 1 singles: No. 40 Lorraine Guillermo (P) def. No. 28 Katie Le 0-6, 6-3, 6-3. Team records: Pepperdine 5-10 overall, 2-0 West Coast Conference; Santa Clara 7-6, 3-1. No. 4 UCLA is tied with No. 49 Stanford 1-1 at Stanford (match suspended by rain, to continue today at noon). No. 1 singles: No. 54 John Morrissey (S) leads No. 14 Marcos Giron 6-3, 1-2. Team records: UCLA 15-1 overall, 1-0 Pac-12 Conference; Stanford 7-6, 0-1. No. 6 Pepperdine def. No. 67 Santa Clara 4-2 in Santa Clara. No. 1 singles: No. 10 Sebastian Fanselow (P) def. No. 63 John Lamble 6-4, 6-1. Team records: Pepperdine 16-4 overall, 3-0 West Coast Conference; Santa Clara 13-7, 1-4. No. 40 BYU def. Saint Mary's 6-1 in Moraga. No. 1 singles: Jesse Kiuru (SM) def. No. 37 Patrick Kawka 7-6 (4), 3-6, 1-0 (11-9). Team records: BYU 15-4 overall, 4-0 West Coast Conference; Saint Mary's 8-9, 3-1. Sacramento State def. North Dakota 7-0 in Sacramento. No. 1 singles: Aliaksandr Malko (SS) def. Josh Oothoudt 6-4, 5-7, 1-0 (10-4). Team records: Sac State 10-10 overall, 5-1 Big Sky Conference; North Dakota 2-8, 1-4. Sacramento State def. Northern Colorado 6-1 in Sacramento. No. 1 singles: Brandon Lupo (NC) def. Aliaksandr Malko 7-6 (3), 7-5. Team records: Sac State 11-10 overall, 6-1 Big Sky Conference; Northern Colorado 8-5, 2-4. Note: The Hornets' No. 1 singles player, Marek Marksoo, sat out Saturday's matches to rest a back injury. USF def. Loyola Marymount in San Francisco. No. 1 singles: Thai Tu (USF) def. Othar Kordsachia 6-2, 6-3. Team records: USF 8-5-1 oveall, 1-2 West Coast Conference; Loyola Marymount 2-15, 0-3. How strong is the Stanford women's tennis team? Its top three players -- Nicole Gibbs, Kristie Ahn and Krista Hardebeck -- are ranked among the top 600 in the world, including professionals. Stacey Tan, the 2011 NCAA singles runner-up, plays No. 4 on the ladder. Don't be deceived by Stanford's relatively modest No. 14 national ranking. College rankings are notoriously unreliable. Besides, the Cardinal will rise after beating No. 4 UCLA 4-3 Friday in Los Angeles. Krista Hardebeck, playing near her home in Santa Ana, gave Stanford an insurmountable 4-1 lead with a 7-5, 6-1 victory over fellow freshman Kyle McPhillips. In girls singles at the Australian Open last year, Hardebeck reached the semifinals and McPhillips the third round. In girls doubles at Melbourne, McPhillips advanced to the quarterfinals and Hardebeck to the second round. Gibbs, the defending NCAA singles and doubles champion, is ranked No. 189 in the world. Ahn is No. 569 and Hardebeck No. 348. Hardebeck, playing as an amateur, reached the semifinals of a $50,000 pro tournament last year at 17 years old and the quarterfinals of another at 15. Stanford (11-2 overall, 5-0 Pacific-12) set up a showdown at No. 6 USC (16-2, 5-0) today at noon for first place in the Conference. UCLA fell to 13-3 and 4-1. No. 14 Stanford def. No. 4 UCLA 4-3 in Los Angeles. No. 1 singles: No. 3 Robin Anderson (UCLA) def. No. 20 Nicole Gibbs 6-4, 6-2. Team records: Stanford 11-2 overall, 5-0 Pac-12; UCLA 13-3, 4-1. No. 6 USC def. No. 13 Cal 6-1 in Los Angeles. No. 1 singles: No. 2 Sabrina Santamaria (USC) def. No. 6 Anett Schutting 6-3, 6-1. Team records: USC 16-2 overall, 5-0 Pac-12; Cal 10-5, 4-1. Pepperdine def. USF 7-0 in Malibu. No. 1 singles: No. 40 Lorraine Guillermo (P) def. No. 78 Andrea Ka 6-4, 7-6. Team records: 4-10 overall, 1-0 West Coast Conference; USF 10-6, 1-3. No. 73 San Jose State def. Seattle 7-0 in San Marcos, Texas. No. 1 singles: Sabastiani Leon Chao (SJS) def. Lindsey Newman 6-1, 6-2. Team records: San Jose State 11-4 overall, 3-0 Western Athletic Conference; Seattle 5-11, 0-4. No. 2 USC def. No. 49 Stanford 6-1 at Stanford. No. 1 singles: No. 6 Emilio Gomez (USC) def. No. 54 John Morrissey 6-4, 6-1. Team records: USC 8-2 overall, 1-0 Pacific-12 Conference; Stanford 7-6, 0-1. No. 4 UCLA def. No. 15 Cal 5-2 in Berkeley. No. 1 singles: No. 44 Ben McLachlan (C) def. No. 14 Marcos Giron 6-2, 7-6 (5). Team records: UCLA 15-1 overall, 1-0 Pac-12; Cal 8-8, 0-1. No. 6 Pepperdine def. USF 6-1 in San Francisco. No. 1 singles: No. 10 Sebastian Fanselow (P) def. Thai Tu 6-1, 7-6 (5). Team records: Pepperdine 15-4 overall, 2-0 West Coast Conference; USF 7-4, 0-2. No. 67 Santa Clara def. Loyola Marymount 4-3 in Santa Clara. No. 1 singles: No. 63 John Lamble (SC) def. Othar Kordsachia 1-6, 6-3, 6-2. Notes: Santa Clara overcame a 3-1 deficit; Tom Pham won the clincher at No. 4 singles. Sacramento's Matt Kecki, a senior transfer from four-time defending NCAA champion USC, won at No. 3 singles and lost at No. 1 doubles for Santa Clara. The Sacramento State women's tennis team will return to Big Sky Conference play at home on Sunday, and not a moment too soon. The Hornets lost to No. 56 San Diego State 4-3 on Thursday to end an 0-3 trip to Southern California against nonconference teams. Sac State also fell to UC Irvine 4-0 and Pepperdine 6-1. In the deciding match against San Diego State (10-4), Kristin Buth of the Aztecs defeated Olivia Boija 6-2, 7-5 at No. 4 singles. Sac State (7-11, 7-0 Big Sky), which has won 99 straight conference matches dating to 2001, will play twice Sunday at the Rio Del Oro Racquet Club in Sacramento. The Hornets will face Northern Colorado (7-6, 3-2) at 9 a.m. and North Dakota (3-11, 0-5) at 2 p.m.
No. 56 San Diego State def. Sacramento State 4-3 in San Diego. No. 1 singles: Rebeca Delgado (SS) def. Julia Wais 6-3, 6-3. Team records: Sac State 7-11, San Diego State 10-4. Santa Clara def. No. 61 Loyola Marymount 5-2 in Los Angeles. No. 1 singles: April Bisharat (LM) def. No. 28 Katie Le 3-6, 6-3, 6-3. Team records: Santa Clara 7-5 overall, 3-0 West Coast Conference; Loyola Marymount 7-6, 0-1. It used to be a showdown when the Stanford men played intrastate rivals USC and UCLA. While the Trojans and Bruins have remained national powers, the Cardinal has gone into a tailspin. Sure, Stanford extended its winning streak to four matches Wednesday with a 7-0 whitewashing of visiting Saint Mary's. But all of those matches came at home against unranked opponents. Stanford, which spent decades at or near the top of men's college tennis, has plummeted to No. 49 in the national rankings. Meanwhile, USC and UCLA are No. 2 and No. 4, respectively. The Cardinal (7-5) will open their Pacific-12 Conference season against the Trojans (17-2) on Friday at 1:30 p.m. and the Bruins (14-1) on Saturday at 2:30 p.m., both at the Taube Family Tennis Stadium on Stanford's campus. Steve Johnson, now playing professionally and ranked No. 138 in the world, led USC to the last four NCAA men's team titles. Saturday's match will be the first televised by the Pac-12 Network, which will join the contest in progress at 4 p.m.
No. 49 Stanford def. Saint Mary's 7-0 at Stanford. No. 1 singles: No. 54 John Morrissey (S) def. Jesse Kiuru 6-3, 6-3. Records: Stanford 7-5, Saint Mary's 8-8. No. 55 Tulane and USF tied 2-2 in a rain-shortened match in San Francisco. No. 1 singles: Dominik Koepfer (T) def. Thai Tu 6-0, 6-0. Records: Tulane 11-5-1, USF 7-4-1. $100,000 RelyAid Natomas Challenger in Sacramento last October. Until recently in professional tennis, hitting age 30 was a death knell. That is, unless your name was Connors, Sampras, Agassi or Navratilova. You lost half a step, which was fatal against an army of young, fast, hungry players. Today, though, many players remain active and even excel in their 30s. Retirement age has been pushed back three to five years. Tommy Haas, 34, of Germany became the oldest player in 30 years to beat the world No. 1 when he stunned Novak Djokovic 6-2, 6-4 tonight in the fourth round of the Sony Open in Miami. That's only the latest example. Three of the eight men's and women's semifinalists in this year's Australian Open were in their 30s: Roger Federer (31), David Ferrer (30) and Li Na (30). Serena Williams (31) would have made it four if she hadn't been upset by 19-year-old fellow American Sloane Stephens 3-6, 7-5, 6-4 in the quarterfinals. No matter. Williams, who hurt her back in the eighth game of the second set, last month became the oldest woman to reach No. 1 in the world. In a first-round men's match in Melbourne, 31-year-old Jarkko Nieminen of Finland upset Haas, seeded 19th, 8-6 in the fifth set before losing in the second round. Then there was Kimiko Date-Krumm. The 42-year-old Japanese became the oldest player to win a match at the Australian Open when she crushed 12th-seeded Nadia Petrova 6-2, 6-0 in the first round. Date-Krumm went on to reach the third round in singles and doubles. Only five years ago in Melbourne, no men or women in their 30s reached the fourth round. Only four -- Vince Spadea (33) of the United States, Stefan Koubek (31) of Austria, Virginia Ruano Pascual (34) of Spain and Ai Sugiyama (32) of Japan -- gained the third round. The SAP Open in San Jose on the ATP World Tour has featured more than an eight-fold increase in the number of players 30 or over in the main draw of singles in the past five years. One-quarter of last month's field, seven of 28 players, were in their 30s. The oldest one, Haas, reached the final. In 2008, Max Mirnyi of Belarus was the only "senior citizen" in the 32-man singles draw, and he had turned 30 only six months beforehand. in the Sacramento Challenger at 31 years old. Four players in the 32-man singles draw of the $100,000 RelyAid Natomas Challenger in Sacramento last October were in their 30s. Benjamin Becker (31) of Germany and James Blake (32) of the United States were seeded first and second, respectively. Blake won the title, and countryman Bobby Reynolds (30) reached the semifinals. Rik de Voest (32) of South Africa lost to Blake in the second round. In the inaugural (2005) Sacramento Challenger (won by de Voest), only Eric Taino had reached his 30th birthday, which came only seven months earlier. "Good question," de Voest said. "I'm not quite sure." Blake, a Harvard alumnus who reached a career-high No. 4 in the world in 2006, also is mystified. He hazarded a few guesses before concluding: "I don't know. Guys just really want to keep playing." Reasons often cited are better nutrition, fitness and post-match treatment. As renowned coach and commentator Brad Gilbert said, "Guys are taking better care of themselves." "I think now that tennis has become an all-year sport, people are doing a much better job of staying in shape and doing much more nutrition, fitness and supplement(s)," Gilbert said. Said Becker: "Oh, I don't know. Maybe they know it's a great job to have and they want to stay in tennis as long as they can. "For me, an example is Tommy Haas. He works very, very hard -- harder than some young guys coming up. He's maybe somebody to look up to because at 34 years old, he's still doing his off-court stuff that nobody else sees except the players and his coach. It's pretty impressive, and that's the reason he can play so long." Becker, returning from a torn groin muscle, lost in the first round of the Natomas Challenger to then-20-year-old American Daniel Kosakowski. Becker traveled with a physiotherapist/fitness coach for the first time that week. "I had some injuries (in 2012), more than I had before," explained Becker, who ended Andre Agassi's career in the third round of the 2006 U.S. Open. "I was actually out almost all (of 2011 because of two operations on his left -- non-playing -- elbow), so now I'm getting to the point where it's very important to have somebody who actually knows my body." Players unanimously say the game has become more physical, and therein lies the key. "The courts are getting slower, and the balls are getting heavier, so there are more rallies," said Becker, who turned pro in 2006. "It's not like it used to be with serving and faster hardcourts. It's getting more physical than even when I started. You have to be in better shape, and you have to be faster and do that for a longer period of time." It seems paradoxical. Wouldn't a more physical game favor younger players? "No," said Becker, the 2004 NCAA singles champion from Baylor in Waco, Texas, "because it takes time to (prepare) your body to be ready for that challenge. There are no more teenagers that come up and be a sensation like Boris Becker (who won Wimbledon in 1985 at 17). It's really tough for guys to come up at 18, 19 years old and have a body to endure the hours on court, to go through the practice sessions and the matches, and do it many times during the week, not just one match. ... "
Instead of careers lasting from age 16 to 30, they often extend from 21 to 35. "I also call it the 'Andre effect,' " said Gilbert, who coached Agassi to six Grand Slam titles, an Olympic gold medal and the No. 1 ranking, all in singles. "People saw that Andre was still doing great in 2005 at 35, and I think he opened a lot of guys' eyes that you can play (well) in your mid-30s." It all started with Sampras' 6-7 (2), 7-6 (9), 6-4, 3-6, 6-2 victory over Goran Ivanisevic in the 1998 Wimbledon final. Ferocious serves on the slick grass dominated the match; rallies were almost nonexistent. Meanwhile, many in the crowd and worldwide television audience fell asleep. Petrified by the prospect of lower TV ratings -- i.e. advertising revenue -- tournament officials made the surface slower. That allowed baseliners such as Lleyton Hewitt and David Nalbandian to meet in the 2002 Wimbledon final, won by Hewitt. The rest of the world followed Wimbledon's lead. Advances in string technology also have made the game more physical. "You can hit a ball harder and create more rotation with the strings on the ball so that it doesn't go out," said the slightly built de Voest, who outlasted strapping U.S. prospect Rhyne Williams, 21 at the time, 5-7, 7-6 (3), 6-4 in the first round of the Sacramento Challenger. Longer points put a premium not only on conditioning and mobility but on experience and strategy. On any given point, players must make split-second decisions on whether to keep the ball in play or go for a winner. Older ones have a better sense of when to play it safe and when to pull the trigger. "As you get older, you get a little wiser," said the undersized Reynolds, who eliminated another powerful American prospect, 20-year-old Jack Sock, 7-6 (6), 7-6 (4) in the opening round of the Sacramento Challenger. "You kind of realize how to play the game of tennis rather than just going out there and hitting balls. It's a lot more about placing your serve in order to get the next shot. It's more like a chess game, and I think it takes time to realize that." Excellent conditioning helps, but a more physical game inevitably means more injuries. That means more forced vacations, allowing players to recover physically and mentally from what amounts to a 12-month grind every year and extend their careers. In addition to Benjamin Becker's elbow operations, Haas has had numerous major operations. Blake missed much of 2004 with a broken neck, suffered when he hit his head on a net post in practice, and a virus. Rafael Nadal recently returned from a seven-month layoff following a knee injury and virus. Date-Krumm retired for 12 years (1997-2008). Legal supplements also could play a role, but presumably they help younger players, too. Most pros agree that playing tennis beats getting a job in the real world -- if there are any. "You have guys now that are 30 and still in unbelievable condition and still have a lot of love for the game," said Reynolds, who attended prestigious Vanderbilt University in Nashville, Tenn., for three years before turning pro 10 years ago. "It's tough to give it up. What else do I want to be doing other than going out here and leaving it all out on the court?" No. 22 Baylor def. No. 15 Cal 6-1 in Waco, Texas. No. 1 singles: No. 71 Julian Lenz (B) def. No. 44 Ben McLachlan 6-3, 6-4. Records: Baylor 13-4, Cal 8-7. No. 67 Santa Clara def. No. 55 Tulane 4-3 in Santa Clara. No. 1 singles: Dominik Koepfer (T) def. No. 63 John Lamble 6-7, 6-1, 6-1. Records: Santa Clara 12-6, Tulane 11-5. Note: Sacramento's Matt Kecki, a senior transfer from four-time NCAA defending champion USC, lost at No. 4 singles and No. 1 doubles for Santa Clara. Everything is relative in college tennis. Exhibit A is the Sacramento State women. The Hornets have won 99 consecutive Big Sky Conference matches dating to 2001. But they are 0-7 against nationally ranked teams this season. Sac State lost to No. 23 UC Irvine of the Big West Conference 4-0 Monday in Irvine. The Anteaters improved to 16-3, and the Hornets fell to 7-9. At No. 1 singles, 101st-ranked Kristina Smith of UC Irvine defeated Rebeca Delgado 6-2, 6-4. UC Irvine's Ali Facey, a sophomore from Cameron Park near Sacramento, won at No. 3 doubles and did not finish her match at No. 5 singles. She trailed Katharina Knoebl 6-4, 4-6, 2-1 when the Anteaters clinched the dual match. Facey's twin sister, Kat, also plays for UC Irvine but did not face Sac State. No. 47 Stanford def. Nevada 5-2 at Stanford. No. 1 singles: No. 88 Nolan Paige (S) def. Victor Ouvrard 7-5, 7-6 (5). Records: Stanford 6-5, Nevada 8-5. Early rounds, Tennis Channel, 8 a.m.-8:30 p.m.
Men's and women's quarterfinals, ESPN2, 10 a.m.-2 p.m.
Women's quarterfinals, Tennis Channel, 4-6 p.m.
Men's and women's quarterfinals/semifinals, ESPN2, 10 a.m.-2 p.m. and 4-8 p.m.
Men's semifinals, ESPN2, noon-2 p.m. and 4-6 p.m.
Women's final, CBS, 9-11:30 a.m.
Men's final, CBS, 8:30-11 a.m.
July 1-7 -- $50,000 Gold River Women's Challenger, Gold River Racquet Club, Gold River, Calif., www.usta.com. 2012 champions: Maria Sanchez, Asia Muhammad-Yasmin Schnack. Aug. 5-11 -- $100,000 Comerica Bank Challenger, Seascape Sports Club, Aptos, Calif., www.seascapesportsclub.com/challenger. 2012 champions: Steve Johnson, Rik de Voest-John Peers. The Cal and Sacramento State men's teams were toast. The No. 24 Bears trailed No. 36 Texas Christian 3-1 in Fort Worth, Texas. Not only were the Hornets behind 3-2 against Loyola Marymount in Los Angeles, Sac State's Tom Miller faced four match points at No. 6 singles. But Cal and Sac State stormed back to win 4-3 thrillers that came down to the last set of the last match. Cal's Gregory Bayane (No. 4 singles) and 47th-ranked Campbell Johnson (No. 3 singles) pulled the Bears even, and freshman Mads Engsted of Denmark won the dual match with a 6-2, 6-7 (4), 7-5 victory over JT Sundling at No. 5 singles. Sac State's Miller, a sophomore from England, outlasted Felix Van Kann 6-7, 6-4, 7-5 to set up the deciding match at No. 1 singles. The Hornets' Marek Marksoo, a sophomore from Estonia, then defeated Othar Kordsachia 4-6, 6-2, 6-4 for his 11th straight singles victory. Making Sac State's victory even more dramatic, Marksoo pulled a back muscle in the first set. Saint Mary's def. Portland 4-3 in Moraga. No. 1 singles: Ratan Gill (P) def. Jesse Kiuru 6-4, 6-7, 1-0 (2). Records: Saint Mary's 8-7 overall, 3-0 West Coast Conference; Portland 8-7, 1-2. Pacific def. Gonzaga 6-1 in Stockton. No. 1 singles: Alvaro Nazal (G) def. Alex Golding 6-7, 6-4, 1-0 (6). No. 15 Stanford def. No. 69 Utah 7-0 at Stanford. No. 1 singles: No. 22 Nicole Gibbs (S) def. No. 69 Tereza Bekerova 2-6, 6-4, 1-0 (7). Records: Stanford 10-2 overall, 4-0 Pacific-12 Conference; Utah 7-7, 1-5. Cal State Fullerton def. Pacific 6-12 in Fullerton. No. 1 singles: Morgan McIntosh (CSF) def. Iveta Masarova 7-6, 6-3. Records: Cal State Fullerton 10-10 overall, 3-4 Big West Conference: Pacific 6-10, 1-3. Three streaks continued in Northern California college tennis on Saturday. The Sacramento State women won their 99th consecutive Big Sky Conference match dating to 2002, Sac State men's No. 1 Marek Marksoo earned his 10th straight singles victory, and the 15th-ranked Stanford women recorded their fourth consecutive shutout. The Sac State women, led by No. 1 singles player Rebeca Delgado, defeated Montana State 6-1 in Sacramento. Marksoo, a sophomore from Estonia, beat Jimmy Roberts of host UC Riverside 6-0, 7-6 (3) to improve to 13-3 in singles this season. And the Stanford women, paced by defending NCAA singles and doubles champion Nicole Gibbs, blanked Colorado 7-0 at Stanford. Sacramento State def. UC Riverside 6-1 in Riverside. No. 1 singles: Marek Marksoo (SS) def. Jimmy Roberts 6-0, 7-6 (3). Records: Sac State 8-10, UC Riverside 2-13. No. 56 New Mexico def. Pacific 4-3 in Stockton. No. 1 singles: Samir Iftikhar (NM) def. Sem Verbeek 6-3, 6-1. Records: New Mexico 9-8, Pacific 10-5. Saint Mary's def. Gonzaga 6-1 in Moraga. No. 1 singles: Alvaro Nazal (G) def. Jesse Kiuru 6-4, 6-3. Records: Saint Mary's 7-7 overall, 2-0 West Coast Conference; Gonzaga 6-8, 0-3. No. 13 Cal def. No. 69 Utah 7-0 in Berkeley. No. 1 singles: No. 9 Anett Schutting (C) def. No. 70 Tereza Bekerova 6-3, 7-5. Records: Cal 10-4 overall, 4-0 Pacific-12 Conference; Utah 7-6, 1-4. No. 15 Stanford def. Colorado 7-0 at Stanford. No. 1 singles: No. 22 Nicole Gibbs (S) def. Julyette Steur 6-3, 6-2. Records: Stanford 8-2 overall, 3-0 Pacific-12 Conference; Colorado 6-10, 1-5. No. 23 UC Irvine def. Pacific 4-0 in Irvine. No. 1 singles: No. 101 Kristina Smith (UCI) def. Hana Ritterova 6-1, 6-3. Records: UC Irvine 14-3 overall, 5-0 Big West Conference; Pacific 6-9, 1-2. Sacramento State def. Montana State 6-1 in Sacramento. No. 1 singles: Rebeca Delgado (SS) def. Charlotta Hjalmarsson 6-1, 6-0. Records: Sac State 7-8 overall, 7-0 Big Sky Conference; Montana State 3-9, 2-3. Santa Clara def. BYU 5-2 in Santa Clara. No. 1 singles: No. 32 Katie Le (SC) def. Desiree Tran 6-3, 6-2. Records: Santa Clara 7-5 overall, 2-0 West Coast Conference; BYU 7-7, 1-2. The Cal women's tennis team won by shutout Friday, and that wasn't even the best news of the day for the Bears. Zsofi Susanyi, ranked third nationally in singles, returned from an undisclosed injury in the No. 13 Bears' 7-0 victory over Colorado in Berkeley. Susanyi played only No. 2 doubles. The sophomore from Hungary teamed with freshman Klara Fabikova of the Czech Republic to defeat Winde Janssens and Carla Manzi Tenorio 8-3. At No. 1 singles, ninth-ranked Anett Schutting outplayed Julyette Steur 6-4, 6-4. Cal (9-4, 3-0 Pacific-12 Conference) will host No. 69 Utah (7-5, 1-3) today at noon at the Hellman Tennis Complex. Colorado (6-9, 1-4) will visit No. 15 Stanford (8-2, 2-0) today at noon at the Taube Family Tennis Stadium. The Buffaloes are making their first trip to the San Francisco Bay Area as Pac-12 members. No. 41 BYU def. USF 4-3 in Provo, Utah. No. 1 singles: No. 42 Patrick Kawka (BYU) def. Thai Tu 7-6 (4), 6-2. Records: BYU 13-4 overall, 2-0 West Coast Conference. USF 6-4, 0-1. No. 66 Pacific def. Iowa 4-3 on Thursday in Stockton. No. 1 singles: Sem Verbeek (P) def. Jonas Dierckx 6-3, 6-1. Records: Pacific 10-4, Iowa 6-7. No. 52 Saint Mary's def. No. 26 Oklahoma 5-2 in Moraga. No. 1 singles: No. 18 Jenny Jullien (SM) def. No. 106 Hermon Brhane 7-5, 7-6 (4). Records: Saint Mary's 8-6, Oklahoma 8-6. San Jose State def. Louisiana Tech 5-2 in San Jose. No. 1 singles: Sabastiani Leon Chao (SJS) def. Alexandra Starkova 6-3, 6-7, 6-2. Records: San Jose State 10-4 overall, 2-0 Western Athletic Conference. Louisiana Tech 6-4, 1-1. Sacramento State def. Montana 6-1 in Gold River, Calif. No. 1 singles: Rebeca Delgado (SS) def. Heather Davidson (from Rocklin in the Sacramento area) 6-1, 6-3. Records: Sac State 6-8 overall, 6-0 Big Sky Conference. Montana 8-6, 4-1. Note: The Hornets have won 98 consecutive Big Sky dual matches. USF def. BYU 4-2 in San Francisco. No. 1 singles: No. 76 Andrea Ka (USF) def. Desiree Tran 6-0, 6-2. Records: USF 8-5 overall, 1-2 West Coast Conference. BYU 7-6, 1-1. USF def. Montana State 6-1 on Thursday in San Francisco. No. 1 singles: No. 76 Andrea Ka (USF) def. Charlotta Hjalmarsson 6-0, 6-1. Records: USF 7-5, Montana State 3-7. No. 66 Fresno State def. Pacific 6-1 on Thursday in Fresno. No. 1 singles: Hana Ritterova (P) def. Rana Sherif Ahmed 6-3, 6-4. Records: Fresno State 9-5, Pacific 6-8. San Jose State def. New Mexico State 6-1 on Wednesday in San Jose. No. 1 singles: Sabastiani Leon Chao (SJS) def. Ginet Pinero 6-1, 6-2. Records: San Jose State 9-4 overall, 1-0 Western Athletic Conference. New Mexico State 4-8, 0-1. 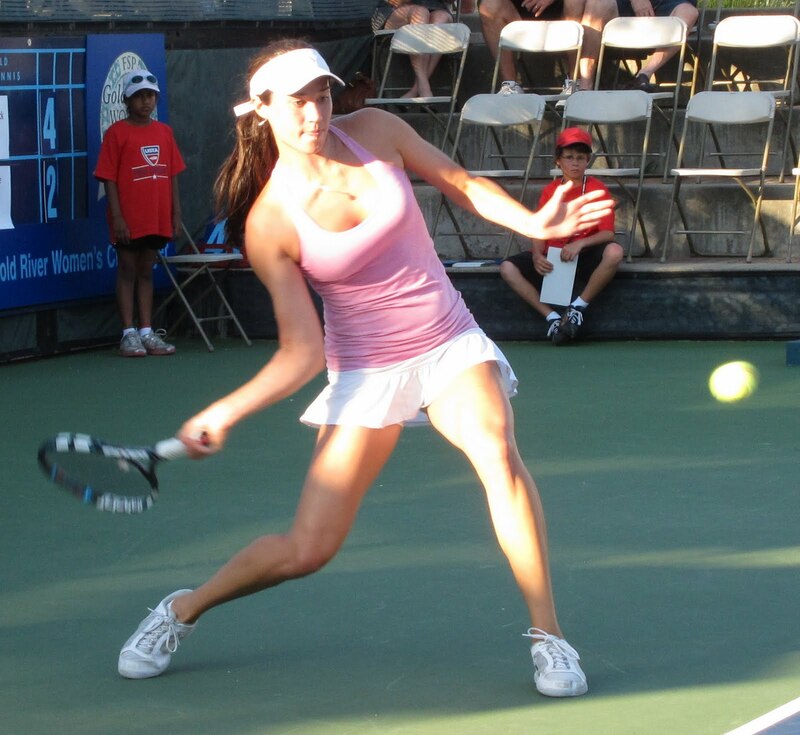 Former professional doubles standout Christina Fusano is scheduled to play in a Sacramento-area exhibition on Saturday to help raise money for the Sierra College women's tennis team. Festivities will begin at 10 a.m. at Ben Combs' clay court at 8582 Westin Lane in Orangevale. Free beer and lunch will be available, and the doubles exhibition is set for 1:30 p.m. Donations can be made at the fundraiser or mailed to the above address (zip code 95662). Checks should be made out to Sierra College Women's Tennis. Fusano was born in Sacramento and grew up in El Dorado, 40 miles (64 kilometers) east of the California capital in the foothills. She attended Cal and won the 2003 NCAA doubles title with Raquel-Kops Jones. Both became doubles specialists in the pros, Fusano peaking at No. 84 in the world in 2008 and Kops-Jones at No. 13 last October. Fusano retired in September 2011 at age 30, but Kops-Jones remains active with a ranking of No. 14. Fusano, only 5-foot-5 (1.65 meters) and 125 pounds (57 kilograms), won one title on the elite WTA tour (Quebec City in 2007 with Kops-Jones) and 13 on the ITF (minor-league) circuit. She reached the second round at Wimbledon in 2008 (with Angela Haynes) and played in the U.S. Open three times. Nick Andrews, Cal All-American in 2012, resident of Folsom in the Sacramento area -- Career-high No. 1,048 in doubles (+3), No. 1,501 in singles (-5). Mardy Fish, Capitals (2012-13) -- No. 33 in singles (-1), unranked in doubles. Bradley Klahn, 2010 NCAA singles champion and 2011 NCAA doubles runner-up from Stanford -- No. 226 in singles (-3), No. 480 in doubles (-9). Scott Lipsky, 2002 NCAA doubles runner-up from Stanford -- No. 26 in doubles (+4), unranked in singles. Sam Querrey, San Francisco native, Capitals (2012-13) -- No. 20 in singles (+3), No. 83 in doubles (-32). Ryan Sweeting, Capitals (2012-13) -- No. 181 in singles (-8), No. 843 in doubles (+1). Dmitry Tursunov, Folsom resident from Russia -- No. 71 in singles (+5), No. 278 in doubles (+2). Pedro Zerbini, All-Pacific-10 Conference first team at Cal (2009-11) -- No. 464 in singles (no change), No. 418 in doubles (-9). Mallory Burdette, NCAA singles runner-up in 2012 and NCAA doubles champion in 2011 and 2012 from Stanford -- Career-high No. 104 in singles (+21), No. 363 in doubles (+2). Raquel Kops-Jones, 2003 NCAA doubles champion from Cal -- No. 14 in doubles (+1), No. 1,149 in singles (-6). Megan Moulton-Levy, Capitals (2013) -- No. 72 in doubles (+2), unranked in singles. Maria Sanchez, Modesto resident -- Career-high No. 109 in singles (+3), No. 121 in doubles (+2). Romana Tedjakusuma, Tracy resident from Indonesia -- No. 463 in singles (-1), No. 1,098 in doubles (+2). Taylor Townsend, Capitals (2013) -- Career-high No. 350 in singles (+121), No. 541 in doubles (+2). Early rounds, Tennis Channel, noon-2 p.m. and 5-7 p.m.
July 1-7 -- $50,000 Gold River Women's Challenger, Gold River, www.usta.com. 2012 champions: Maria Sanchez, Asia Muhammad-Yasmin Schnack. You avoided being shut out of the top 20 in the men's world rankings for the first time. You still hit a new low. By reaching the fourth round of the BNP Paribas Open at Indian Wells last week (including a first-round bye), Sam Querrey rose three places to No. 20 in the new rankings and became the top American for the first time. Querrey, a 25-year-old San Francisco native and part-time member of the Sacramento Capitals in World TeamTennis, replaced 6-foot-9 (2.06-meter) John Isner in the top 20. Isner, the runner-up in last year's BNP Paribas Open, dropped eight spots to No. 23 after losing to 32-year-old Lleyton Hewitt in the second round at Indian Wells. Querrey, a 6-foot-6 (1.98-meter) right-hander, reached a career high of No. 17 in January 2011 before undergoing right elbow surgery that June and plunging to No. 125 the following September. 1. Bjorn Borg, Sweden; 2. John McEnroe, United States; 3. Jimmy Connors, United States; 4. Gene Mayer, United States; 5. Guillermo Vilas, Argentina; 6. Ivan Lendl, Czechoslovakia; 7. Harold Solomon, United States; 8. Jose-Luis Clerc, Argentina; 9. Vitas Gerulaitis, United States; 10. Eliot Teltscher, United States. On the bright side for U.S. men's tennis, Bob and Mike Bryan won a record 13th Grand Slam men's doubles title at the Australian Open in January. They are ranked No. 1. Women's rankings -- Mallory Burdette and Maria Sanchez have many similarities. Both are young, 5-foot-10 (1.78-meter) Americans with Northern California ties. And both could crack the top 100 in the world for the first time soon. After reaching the third round of the BNP Paribas Open as a qualifier, the 22-year-old Burdette jumped 21 places to No. 104 only six months after turning professional out of Stanford. The Macon, Ga., native knocked off then-No. 27 Tamira Paszek of Austria in the second round. Sanchez, a 23-year-old Modesto product, improved three notches to No. 109 by advancing to the second round at Indian Wells as a wild card. Sanchez's mentor, International Tennis Hall of Famer Chris Evert, attended the tournament. Both Burdette and Sanchez played in the main draw at Indian Wells for the first time. Fish withdraws -- Mardy Fish suffered a setback in his latest comeback from an accelerated heartbeat when the former top-10 player withdrew from the Sony Open in Miami. The tournament began today. Fish, 31, missed 2 1/2 months last spring while undergoing a procedure, played throughout the summer, then sat out for six more months. He said he retired from tennis "15 times" in his mind during his second layoff but returned two weeks ago in the BNP Paribas Open. Fish drew a bye in the first round at Indian Wells and beat fellow 30-something American Bobby Reynolds, a qualifier, 6-3, 3-6, 6-4 in the second round before losing to eighth-seeded Jo-Wilfried Tsonga of France 7-6 (6), 6-4 in the third round. Fish has dropped from a career-high No. 7 in the world in 2011 to No. 33. A quarterfinalist in Miami last year, he will plummet further when the next rankings are released on April 1. No. 25 Tulsa def. USF 6-0 in San Francisco on Monday. No. 1 singles: No. 31 Samantha Vickers (T) def. No. 76 Andrea Ka 5-7, 6-4, 10-6 match tiebreaker. Records: Tulsa 11-5, USF 6-5. No. 25 Tulsa def. No. 52 Saint Mary's 4-3 in Moraga on Tuesday. No. 1 singles: No. 31 Samantha Vickers (T) def. No. 18 Jenny Jullien 6-7, 7-6, 6-2. Records: Tulsa 12-5, Saint Mary's 7-7. Rafael Nadal showed no signs of rust at Indian Wells. Seven-month layoff? What seven-month layoff? Rafael Nadal improved to 17-1 this year, the best start of his career, with a 4-6, 6-3, 6-4 victory over Juan Martin del Potro on Sunday in the final of the BNP Paribas Masters at Indian Wells. It was Nadal's third Indian Wells title, record-breaking 22nd ATP World Tour Masters 1000 trophy, 14th straight match victory and 600th match win of his career. Nadal had been tied with Roger Federer for the most Masters crowns. Federer, with 891 match wins, is the only other active player to reach 600. In the women's final, third-ranked Maria Sharapova outslugged No. 10 Caroline Wozniacki 6-2, 6-2 for her second Indian Wells crown. Nadal, ranked fifth, returned to the tour last month after sitting out since Wimbledon because of a knee injury and a short bout with a virus. He beat second-ranked Roger Federer in the quarterfinals at Indian Wells and No. 6 Tomas Berdych in the semifinals. "A lot of things happened the last seven months, [so] to be back here and to have this very heavy trophy with me is amazing," Nadal, who also won the Indian Wells title in 2007 and 2009, told reporters. "Beating three top 10 players and winning a title like this is just something unbelievable for me. I'm very, very happy and very emotional." Nadal, 26, overcame a 4-6, 1-3 deficit in the final on an 89-degree Fahrenheit (31-degree Celsius) day. "I think Rafa deserved to win," said the seventh-ranked del Potro, who was coming off three-set victories over third-ranked Andy Murray in the quarterfinals and No. 1 Novak Djokovic in 95-degree Fahrenheit (35-degree Celsius) heat each day. "The last hour of the match, he played so solid and put me so far (from) the baseline and made winners. But I think I (had) a good tournament anyway." Sharapova cracked 33 winners to two for Wozniacki in their 81-minute match. "The scoreline looks a lot easier than I think the match actually was," said Sharapova, who also captured the Indian Wells title in 2006. "I think it was a tough match, a tough battle, and there were a lot of games that went to deuce and a lot of long games. They could have easily swung the other way, especially some opportunities she had in that second set. I always felt like I was always a foot ahead, especially with the breaks. I was able to serve well today, and that helped me." Sacramento State def. Weber State 5-2 in Ogden, Utah. No. 1 singles: Marek Marksoo (SS) def. Jakub Gewert 6-2, 6-3. Records: Sac State 7-9 overall, 4-0 Big Sky Conference; Weber State 4-7, 2-2. Idaho State def. Sacramento State 4-3 in Pocatello, Idaho. No. 1 singles: Marek Marksoo (SS) def. Christian Marian 6-4, 7-5. Records: Idaho State 5-2 overall, 4-0 Big Sky Conference; Sac State 7-10, 4-1. No. 15 Cal def. No. 52 San Diego State 6-1 in San Diego. No. 1 singles: No. 8 Anett Schutting (C) def. Julia Wais 6-3, 4-6, 6-2. Records: Cal 8-5, San Diego State 7-4. Nevada def. Sacramento State 4-3 in Sacramento. No. 1 singles: Rebeca Delgado (SS) def. Michelle Okhremchuk 6-4, 4-6, 7-5. Records: Nevada 5-4, Sac State 5-8. Cal State Northridge 4, UC Davis 3 in Northridge. No. 1 singles: Megan Heneghan (UCD) def. Maria Pistalu 7-6 (1), 6-3. Records: Cal State Northridge 8-3 overall, 3-2 Big West Conference; UC Davis 6-9, 2-2. It has been a long road back for Juan Martin del Potro. After using his percussive serve and forehand to shock Roger Federer and win the 2009 U.S. Open, del Potro underwent surgery on his right (playing) wrist in 2010 and missed eight months. The 24-year-old Argentine took another big step in his return on Saturday with a 4-6, 6-4, 6-4 victory over top-ranked Novak Djokovic in the semifinals of the BNP Paribas Open at Indian Wells. "I was doing a very good match until the third set, but Novak had the chance to beat me when I was down 3-love," del Potro, ranked and seeded seventh, said on atpworldtour.com. "But I came back soon, and that gave me a little confidence to come back in that set. Then also the crowd wanted to watch more tennis, and [it] helped me to play my best tennis in the end. I think it was my best match in this tournament, for sure." Djokovic had won 22 straight matches dating to last October, including his third straight Australian Open title in January. "All the credit to my opponent today," he said. "He deserved to win because he was more composed in the important moments, and he played the right shots. He stepped into the court, where, on the other side, I made a lot of unforced errors and was at the back of the court [and was] too passive." The 6-foot-6 (1.98-meter) Del Potro will meet fifth-seeded Rafael Nadal in today's final at 2 p.m. or later (ESPN2). Nadal, who won the title in 2007 and 2009, advanced with a 6-4, 7-5 victory over sixth-seeded Tomas Berdych of the Czech Republic. Nadal won the last four games of the match. Nadal is 7-3 lifetime against del Potro, but the series is tied 3-3 on hardcourts. Nadal, who returned to the circuit in February after missing seven months because of a knee injury and then a virus, has won both of their meetings at Indian Wells in straight sets. Also, Nadal will be fresher than del Potro. The 26-year-old Spaniard has won his last two matches in straight sets, while del Potro has been extended to three sets on back-to-back 95-degree Fahrenheit (35 Celsius) days. Del Potro defeated third-ranked Andy Murray 6-7 (5), 6-3, 6-1 on Friday. Meanwhile, top-ranked Bob and Mike Bryan from the nearby Los Angeles area finally won the men's doubles title at Indian Wells. Playing in the tournament for the 15th straight year, they edged Treat Huey, a Washington, D.C., native who plays for the Philippines, and Jerzy Janowicz of Poland 6-3, 3-6, 10-6 match tiebreaker. Second-seeded Maria Sharapova of Russia will face eighth-seeded Caroline Wozniacki of Denmark for the women's title today at noon (ESPN2) in a matchup of former Indian Wells champions. Sharapova triumphed in 2006 and Wozniacki in 2011. Sharapova has a career record of 4-2 against Wozniacki, although the series is tied 2-2 on hardcourts. No. 12 Pepperdine def. No. 16 Cal 4-3 in Berkeley. No. 1 singles: No. 57 Ben McLachlan (C) def. No. 11 Sebastian Fanselow 6-2, 6-3. Records: Pepperdine 11-4, Cal 7-6. Sacramento State def. Southern Utah 7-0 in Cedar City, Utah. No. 1 singles: Aliaksandr Malko (SS) def. Troy Benson 6-0, 6-2. Records: Sac State 6-9 overall, 3-0 Big Sky Conference. Southern Utah 0-3, 0-3. Purdue def. Santa Clara 4-3 in Santa Clara. No. 1 singles: No. 68 John Lamble (SC) def. Szymon Tatarczyk 3-6, 6-2, 6-2. Records: Purdue 13-3, Santa Clara 11-6. Nevada def. Pacific 5-2 in Stockton. No. 1 singles: Michelle Okhremchuk (N) def. Iveta Masarova 6-1, 6-4. Records: Nevada 5-4 overall, 0-1 Mountain West Conference. Pacific 6-7, 1-1 Big West Conference. UC Davis def. Cal State Fullerton 6-1 in Fullerton. No. 1 singles: Megan Heneghan (UCD) def. Tiffany Mai 6-1, 6-3. Records: UC Davis 6-8 overall, 2-1 Big West Conference. Cal State Fullerton 8-9, 2-4. Novak Djokovic in the Australian Open final in late January. In the past eight years, only two men besides Roger Federer, Rafael Nadal and Novak Djokovic have won a Grand Slam singles title. Those two players, Andy Murray and Juan Martin del Potro, met Friday in the quarterfinals of the BNP Paribas Open at Indian Wells. Del Potro scored a mild upset with a 6-7 (5), 6-3, 6-1 victory, only his second in seven matches against Murray. Del Potro, 24, of Argentina and Murray, 25, of Great Britain won the U.S. Open in 2009 and last year, respectively, for their only Grand Slam crowns. Del Potro, who underwent surgery on his right (playing) wrist in 2010 and was sidelined for eight months, has played in one Grand Slam final and Murray in six. Del Potro, seeded seventh, was more match tough for Friday's encounter. He improved to 15-3 this year, including the title at Rotterdam last month. Murray, seeded third, was playing in his first tournament since losing to Djokovic in the Australian Open final in late January. "He played like someone that's won a lot of matches recently," Murray told reporters. "Especially in the second and third set when the important moments came, he played well." Murray would have replaced Federer at No. 2 in the world by reaching the final. Instead, Del Potro will face the top-ranked Djokovic in today's second semifinal at approximately 2 p.m. PDT (ESPN News),. Djokovic, who owns a 22-match winning streak, leads the head-to-head series 8-2. In today's first semifinal at noon (ESPN News), fifth-seeded Rafael Nadal of Spain will meet sixth-seeded Tomas Berdych of the Czech Republic. It will be a rematch of the 2010 Wimbledon final, won by Nadal in straight sets. He seeks his third Indian Wells title after triumphing in 2007 and 2009. Second-seeded Maria Sharapova will take on eighth-seeded Caroline Wozniacki on Sunday for the women's title in a matchup of former Indian Wells champions. Sharapova, the 2006 titlist, beat another Maria from Russia, the 13th-seeded Kirilenko, 6-4, 6-3 to reach the final for the second straight year. Wozniacki, the 2011 winner from Denmark, outlasted fourth-seeded Angelique Kerber of Germany 2-6, 6-4, 7-5. Sharapova is 4-2 lifetime against Wozniacki, although the series is tied 2-2 on hardcourts. Former Stanford stars Bob and Mike Bryan, the top-ranked men's doubles team in the world, will play unseeded Treat Huey, a Washington, D.C., native who plays for the Philippines, and Jerzy Janowicz of Poland for the title today at 4 p.m. or later (Tennis Channel). The Bryans, from the nearby Los Angeles area, seek their first Indian Wells title in their 15th straight appearance there and third final. The 5-foot-10 (1.78-meter) Huey and the 6-foot-8 (2.03-meter) Janowicz, playing in their first tournament together, saved two match points in a 7-5, 1-6, 12-10 match tiebreak victory over unseeded Alexander Peya of Austria and Bruno Soares of Brazil in the semifinals. No. 23 UC Irvine def. UC Davis 4-0 in Irvine. No. 1 singles: No. 101 Kristina Smith (UCI) def. Megan Heneghan 6-2, 6-3. Records: UC Irvine 13-3 overall, 4-0 Big West Conference. UC Davis 5-8, 1-1. Sacramento State def. Weber State 7-0 in Ogden, Utah. No. 1 singles: Rebeca Delgado (SS) def. Kristi Elmer 6-3, 6-3. Records: Sac State 4-7 overall, 4-0 Big Sky Conference. Weber State 5-10, 1-3. Sacramento State def. Idaho State 7-0 in Pocatello, Idaho. No. 1 singles: Rebeca Delgado (SS) def. Kasey Bacon 6-2, 6-3. Records: Sac State 5-7 overall, 5-0 Big Sky Conference. Idaho State 1-8, 1-3. It was the biggest letdown since Twinkies went off the market. What was supposed to be a blockbuster day at Indian Wells turned into a colossal dud because of injuries. improved to 19-10 lifetime against Roger Federer. In Thursday's featured evening match, Rafael Nadal dispatched Roger Federer 6-4, 6-2 in the quarterfinals of the BNP Paribas Open. Nadal is playing in his first hardcourt tournament after missing seven months because of a left knee injury and then a virus. Federer tweaked his back earlier in the BNP Paribas Open. At least Nadal and Federer made it to the court. Both women's quarterfinals during the day session were wiped out. Top-seeded Victoria Azarenka of Belarus was scheduled to play eighth-seeded Caroline Wozniacki of Denmark in a matchup of former No. 1 players, but Azarenka defaulted with an ankle injury. Also, No. 7 seed Sam Stosur of Australia pulled out of her scheduled match against No. 4 seed Angelique Kerber of Germany with a calf problem. Nadal improved to 19-10 lifetime against Federer in their earliest meeting in a single-elimination tournament since their first one in 2004, a 6-3, 6-3 victory by Nadal in the round of 32 at Miami. Nadal's layoff relegated him to the fifth seed at Indian Wells. He returned to the tour one month ago, winning two of three tournaments on clay. "Two weeks ago, I didn't know if I can be here, and (Saturday) I will be in semifinals here," Nadal, 26, told reporters. "But is a big surprise for me to have these results. I was able to practice just a little before the comeback. Important thing is to be healthy. And if that happens and I'm able to practice as much as I can, as much as I want, probably that the comeback will be a little bit less difficult, no?" The Associated Press reported that Nadal had his knee wrapped for Thursday's match and limped slightly at times. "No question, he's a bit careful at times, his movement," Federer told reporters. "That's totally normal. Hasn't played for some time on hardcourt. I don't know if it's careful or if it's just getting used to it again." Federer had his own physical problems. "I'm happy to be out there and able to compete, but it's obviously a small issue," said Federer, 31. "That doesn't work against guys like Rafa, obviously." Nadal, the 2007 and 2009 champion at Indian Wells, will meet sixth-seeded Tomas Berdych of the Czech Republic in the semifinals. Berdych eliminated unseeded Kevin Anderson of South Africa 6-4, 6-4. Meanwhile, the 15th time might be the charm for Bob and Mike Bryan. The 34-year-old identical twins, who have won virtually every other men's doubles honor, seek their first Indian Wells title in their 15th consecutive appearance there. They grew up about a two-hour drive east in the Los Angeles area. The top-ranked Bryans saved a match point in their 6-4, 4-6, 11-9 match tiebreak victory over unseeded Santiago Gonzalez and Scott Lipsky and reached their third Indian Wells final. All but Gonzalez starred at Stanford. The Bryans won the Australian Open in January for a record 13th Grand Slam men's doubles title. They will face either Treat Huey, a Washington, D.C., native who plays for the Philippines, and Jerzy Janowicz of Poland or Alexander Peya of Austria and Bruno Soares of Brazil. Both teams are unseeded. Sacramento State def. Southern Utah 6-1 in Cedar City, Utah. No. 1 singles: Rebeca Delgado (SS) def. Veronika Rogova 6-1, 6-0. Records: Sac State 3-7 overall, 2-0 Big Sky Conference; Southern Utah 4-4, 0-1. No. 48 Southern Methodist def. Santa Clara 5-2 in Santa Clara on Wednesday. No. 1 singles: Aleksandra Malyarchikova (SM) def. No. 32 Katie Le 6-2, 7-6 (tiebreaker score not available). Records: Southern Methodist 9-5 overall, 1-1 Conference USA; Santa Clara 5-5, 1-0 West Coast Conference. For the second straight meeting, Novak Djokovic drubbed Sam Querrey 6-0 in the first set. This time, however, Djokovic won the match. In a match that ended at 1:51 a.m. PDT Thursday, the top-ranked Djokovic eliminated No. 23 Sam Querrey 6-0, 7-6 (6) in the fourth round of the BNP Paribas Open at Indian Wells. Djokovic is 21-0 since the Paris Masters and 16-0 this year. The 25-year-old Serb, who won Indian Wells in 2008 and 2011, will meet eighth-seeded Jo-Wilfried Tsonga of France on Friday in the quarterfinals. Tsonga edged 17th-seeded Milos Raonic of Canada 4-6, 7-5, 6-4. Second-seeded Roger Federer and fifth-seeded Rafael Nadal will renew their storied rivalry Thursday at 7 (Tennis Channel) in the quarterfinals. It will be their earliest meeting since their first one, a 6-3, 6-3 victory by Nadal in the round of 32 at Miami in 2004. Nadal recently returned to the circuit after missing seven months with a knee injury and virus. Nadal, 26, leads the 31-year-old Federer 18-10 in their head-to-head series. Federer, though, leads 6-5 on hardcourts, including a 6-3, 6-4 victory in last year's semifinals at Indian Wells. Querrey, a San Francisco native and part-time member of the Sacramento Capitals in World TeamTennis, will replace John Isner as the No. 1 American when the new rankings are released Monday. Querrey will return to the top 20 after reaching a career-high No. 17 in January 2011. Later that year, the 6-foot-6 (1.98-meter) right-hander underwent right elbow surgery and plunged to No. 125. The 6-foot-9 (2.06-meter) Isner, ranked 15th, lost to 32-year-old Lleyton Hewitt in the second round at Indian Wells after reaching last year's final. Meanwhile, the comeback tournament of part-time Capital Mardy Fish ended. The wild-card team of Fish and fellow American James Blake lost to unseeded Treat Huey, a Washington, D.C., native who plays for the Philippines, and Jerzy Janowicz of Poland 7-5, 6-2 in the doubles quarterfinals. Janowicz is 6-foot-8 (2.04 meters), and Huey is 5-foot-10 (1.78 meters). Fish won the 2009 doubles title at Indian Wells with close friend Andy Roddick, who retired last September at 30, and upset Federer in the 2008 singles semifinals before losing to Djokovic. Seeded 32nd in singles this year, Fish lost to Tsonga in the third round on Tuesday. Fish, a 31-year-old Los Angeles-area resident, had been sidelined for six months with heart palpitations. The future of U.S. women's tennis is coming to Sacramento. The Capitals selected Taylor Townsend, 16, of Stockbridge, Ga., in the second round of Tuesday's World TeamTennis roster draft. Townsend, a sturdy 5-foot-6 African-American, has been compared to Serena Williams. But as an aggressive left-hander, she plays more like her idol, Martina Navratilova. Last year, Townsend swept the girls singles and doubles titles in the Australian Open, added the girls doubles crowns at Wimbledon and the U.S. Open and ended the year as the No. 1 junior in the world. She became the first American to sweep the girls crowns in a Grand Slam event since Lindsay Davenport in the 1992 U.S. Open and the first U.S. girl to hold the No. 1 year-end world ranking since Gretchen Rush in 1982. Townsend debuted on the elite WTA tour last week as a wild card in the BNP Paribas Open at Indian Wells. She beat No. 57 Lucie Hradecka of the Czech Republic before losing to former world No. 1 and 2008 champion Ana Ivanovic. the Sacramento Capitals in World TeamTennis. Sacramento also protected Mark Knowles of the Bahamas in the first round, picked American doubles specialist Megan Moulton-Levy in the third round and took Ryan Sweeting of the United States in the fourth and final round. Knowles, 41, retired from the ATP World Tour after last year's U.S. Open. But the three-time WTT Male MVP (2001, 2005 and 2007) will return for his 12th season in the league, all with Sacramento. Moulton-Levy, only 5-foot (1.52 meters) and 135 pounds (61 kilograms), is ranked No. 74 in the world in doubles. Sweeting, the 2005 U.S. Open boys champion, played one match for the Capitals last season but suffered back spasms and missed his other scheduled match. Mardy Fish and San Francisco native Sam Querrey are set to return as Sacramento's marquee players. Fish, who reached No. 7 in the world in 2011, is scheduled to play three of the Capitals' 14 regular-season matches, and the 23rd-ranked Querrey plans to play four. Missing from the roster after playing for Sacramento last year are 2012 part-timers Kevin Anderson, CoCo Vandeweghe and Vania King and full-timers Asia Muhammad and Yasmin Schnack. Anderson, a 6-foot-8 (2.03-meter) right-hander, underwent right elbow surgery in January after climbing to No. 28 one year ago. He and Muhammad are not scheduled to play team tennis this season. The 99th-ranked Vandeweghe, who lives in the San Diego area, was a roster-exempt selection by Orange County. King, the 2009 WTT Female MVP for Springfield (Mo. ), went back to the Lasers in the roster-exempt draft after three seasons in Sacramento. Schnack, a 24-year-old doubles specialist, retired from professional tennis in November. Sacramento has won a record six WTT titles but none since 2007. The Capitals squeaked into the playoffs last season with an 8-6 mark and advanced to the WTT Finals, falling to the defending champion Washington Kastles 20-19 in Charleston, S.C. Washington has won 32 consecutive matches. In the 2012 regular season, Sacramento finished third among eight teams in men's singles, fifth in women's singles, fourth in men's doubles, seventh in women's doubles and fourth in mixed doubles. The Capitals open the 2013 season on July 7 against the Texas Wild at Sunrise Mall in the Sacramento suburb of Citrus Heights. Alisa Kleybanova, who was diagnosed with lymphoma in May 2011, was drafted first overall by Springfield. Kleybanova, a 23-year-old Russian, ascended to No. 20 in the world in singles and No. 10 in doubles in February 2011. Washington acquired Martina Hingis from the New York Sportimes for financial considerations. Hingis, 32, will be inducted into the International Tennis Hall of Fame in July. BNP Paribas Open -- Querrey advanced to the fourth round at Indian Wells, ensuring that he will become the No. 1 American man and that the United States won't be shut out of the top 20 in the men's world rankings for the first time. Querrey, seeded and ranked 23rd, outlasted Marinko Matosevic of Australia 7-6 (5), 6-7 (7), 7-5 in the longest match of the tournament at 2 hours, 47 minutes. Querrey will return to the top 20 after reaching a career-high No. 17 in January 2011. The 6-foot-6 right-hander missed three months after undergoing right elbow surgery on June 16 that year and dropped to No. 125. He will replace John Isner as the top American. "It means a lot. It's a great feeling," Querrey, 25, said on www.bnpparibasopen.com. "I feel like I have worked hard to earn it. Everyone seems like they've got their shot with Andy (Roddick) and Mardy and James (Blake) and John, and so I feel like it's my turn now." Querrey will meet world No. 1 and two-time Indian Wells champion Novak Djokovic on Wednesday at 8:30 p.m. PDT or later (Tennis Channel). Djokovic improved to 15-0 this year with a 7-6 (4), 6-1 victory over 31st-seeded Grigor Dimitrov of Bulgaria. Querrey is the last player to beat Djokovic, prevailing 0-6 7-6 (5), 6-4 in the second round of the Paris Masters last October. After the match, Djokovic told reporters: "It's unfortunate, but on the brighter side, I have a little bit more time to rest because I had really difficult period in the last couple of weeks. Some things happened and a lot of things on my mind." Djokovic, who's 4-1 against Querrey, seeks his third title of the year after winning the Australian Open and at Dubai. Meanwhile, eighth-seeded Jo-Wilfried Tsonga of France defeated the 32nd-seeded Fish 7-6 (4), 7-6 (0) in the third round. Fish, who returned to the circuit at Indian Wells after missing six months because of heart palpitations, led 4-0 in the second set and was broken at love serving for the set at 5-4. "I felt like I could have easily won the match," Fish said on www.bnpparibasopen.com. "Bunch of break points obviously in the first set, and the second set was what it was. Tennis wise, it's a good sign that it hasn't taken too long to get the form back. I usually don't lose 4-0 sets. I can't remember the last one. Maybe just not being in that position I'm sure had something to do with it." Fish remains alive in doubles with Blake. The wild cards are scheduled to face Treat Huey, a Washington, D.C., native who plays for the Philippines, and Jerzy Janowicz of Poland on Wednesday in the quarterfinals. Fish won the 2009 doubles title at Indian Wells with his close friend Andy Roddick. Sacramento State def. Montana State 7-0 in Sacramento. No. 1 singles: Marek Marksoo (SS) def. Niklas Brandes 6-1, 6-2. Records: Sac State 5-9 overall, 2-0 Big Sky Conference; Montana State 9-7, 5-1. Mardy Fish was just happy to be on the court. In his first official singles match in six months, the 32nd-seeded Fish edged qualifier Bobby Reynolds 6-3, 3-6, 6-4 Sunday in the second round of the BNP Paribas Open in Indian Wells. Fish is scheduled to return for his second part-time season with the Sacramento Capitals in World TeamTennis in July. He trailed by a break in the last set against Reynolds in a matchup of 30-something Americans but won the final four games. Reynolds embraced Fish after the match. Fish, who drew a bye in the first round, has battled an irregular heartbeat since last spring. He had not played since defaulting against Roger Federer in the round of 16 at the U.S. Open last September because of his heart problem. "It's been a tough few months, for sure," a subdued Fish, 31, told Tennis Channel analyst Justin Gimelstob. "You sort of feel like it was a win just to go back out there. "I retired (from tennis) about 15 times in my mind. Only a few people know what we went through. I say 'we' because it's a team." Ranked as high as No. 7 in 2011, Fish has dropped to No. 32. He defeated Federer in the 2008 semifinals at Indian Wells before losing to Novak Djokovic. Fish will meet eighth-seeded Jo-Wilfried Tsonga of France on Tuesday in the third round. Tsonga beat wild card James Blake of the United States 7-6 (6), 6-4. The wild-card team of Blake and Fish will play Feliciano Lopez of Spain and Milos Raonic of Canada today in the second round. Sam Querrey, who also played part-time for the Capitals last season, dispatched 6-foot-10 (2.08-meter) qualifier Ivo Karlovic 6-3, 6-4 in the second round. Querrey, ranked 23rd, almost certainly will replace John Isner as the top American when the new rankings are released next Monday. The 15th-seeded Isner, who toppled Djokovic in last year's semifinals at Indian Wells before losing to Federer, fell in the second round to 32-year-old Lleyton Hewitt, who won the title in 2002 and 2003. On the women's side, 13th-seeded Maria Kirilenko of Russia stopped qualifier Mallory Burdette of the United States 6-3, 4-6, 6-2 in the third round. Burdette, who turned pro six months ago after her junior season at Stanford, will crack or approach the top 100 in the new rankings. She's currently No. 125. Kirilenko, a quarterfinalist at Wimbledon and Indian Wells last year, won the title at Pattaya City in Thailand last month. No. 24 Cal def. No. 4 Duke 4-3 in Berkeley. No. 1 singles: No. 9 Henrique Cunha (D) def. No. 56 Ben McLachlan 6-7 (3), 6-4, 6-4. Records: Cal 7-5, Duke 12-3. No. 49 Stanford def. Boise State 4-3 at Stanford. No. 1 singles: No. 30 Andrew Bettles (BSU) def. No. 45 John Morrissey 6-4, 7-6 (2). Nevada def. Sacramento State 4-3 in Sacramento. No. 1 singles: Victor Ouvrard (N) def. Aliaksandr Malko (substituting for injured Marek Marksoo) 4-6, 7-6 (5), 6-4. Records: Nevada 8-4, Sac State 4-9. Santa Clara def. Northern Arizona 5-2 in Santa Clara. No. 1 singles: No. 66 John Lamble (SC) def. Shaun Waters 6-3, 6-4. Records: Santa Clara 11-5, Northern Arizona 2-12. Texas-Arlington def. UC Davis 5-2 in Davis. No. 1 singles: Yauheni Yakauleu (TA) def. Toki Sherbakov 6-4, 7-5. Records: Texas-Arlington 5-4, UC Davis 6-8. No. 20 Stanford def. No. 38 Texas 7-0 at Stanford. No. 1 singles: No. 87 Nicole Gibbs (S) def. No. 28 Aeriel Ellis 2-6, 6-4, 10-1 match tiebreaker. Records: Stanford 8-2, Texas 3-6. No. 49 Saint Mary's def. USF 6-1 in San Francisco. No. 1 singles: No. 18 Jenny Jullien (SM) def. Andrea Ka 6-2, 6-4. Records: Saint Mary's 7-6, USF 6-3. Sacramento State def. Northern Arizona 5-2 in Sacramento. No. 1 singles: Rebeca Delgado (SS) def. Ghizelene Doballah 6-1, 6-0. Records: Sac State 2-7, Northern Arizona 6-8. Cal State Northridge def. Pacific 4-3 in Northridge. No. 1 singles: Maria Pistalu (CSN) def. Iveta Masarova 3-6, 6-1, 6-0. Records: Cal State Northridge 6-3, Pacific 6-6. John Isner's slump continued Saturday, which is bad news for U.S. men's tennis. The United States, a tennis power throughout the 1900s, already has no men in the top 10 in the world. Come March 18, when the next rankings are released, there's a good chance that the nation will have no one in the top 20. As John McEnroe once famously said, you cannot be serious. The 6-foot-9 (2.06-meter) Isner, who missed the Australian Open in January with a knee injury, lost to 32-year-old Lleyton Hewitt 6-7 (6), 6-3, 6-4 in the second round of the BNP Paribas Open in Indian Wells. Hewitt won the title there an eternity ago -- in 2002 and 2003. "It was a tough match," Isner told reporters. "I knew it was going to be. Lleyton is such a good competitor. I felt like I could have played a little bit better. I needed to play very well to win today, and I don't feel like I necessarily did that. But I think Lleyton had a lot to do with it. It's very disappointing. "But I believe things will get better. ... Just gotta keep plugging away." Isner, the top American at No. 15, nevertheless will plummet in the rankings after reaching last year's final at Indian Wells. He beat top-ranked Novak Djokovic, the defending champion, in the semifinals before losing to Roger Federer. The rankings operate on a rotating 52-week basis. Therefore, Isner's results from Indian Wells last year are replaced on the computer by his results there this year. Everything else being equal, he would have had to reach this year's final just to stay No. 15. Sam Querrey, a 6-foot-6 (1.98-meter) native of San Francisco, likely will replace Isner as the top American. Querrey, though, faces a tall order -- literally -- trying to rise from No. 23 in the world. He is scheduled to meet 6-foot-10 (2.08-meter) qualifier Ivo Karlovic of Croatia today in the second round after losing at that stage last year at Indian Wells. Karlovic, 34, held the record for the world's fastest serve at 156 mph (251 kph) until Samuel Groth of Australia was credited with a 163.4-mph (263-kph) missile last year. Although five other Americans reside in the top 100, the only possible bright spot is 20-year-old prospect Ryan Harrison at No. 73 in the world. No. 32 Mardy Fish is 31 years old with heart trouble. No. 56 Brian Baker, who returned to the tour last year after missing six years because of five major operations, underwent surgery for a torn meniscus in January. No. 70 Michael Russell is 34 years old and only 5-foot-8 (1.73 meters) in an era of power. No. 99 James Blake is 33 years old. Meanwhile, two of Querrey's teammates on the Sacramento Capitals in World TeamTennis last season also made news at Indian Wells on Saturday. South Africa's Kevin Anderson, a 6-foot-8 (2.03-meter) right-hander playing in his second tournament since undergoing right elbow surgery, ousted fourth-seeded David Ferrer 3-6, 6-4, 6-3 in the second round. Fish, playing his first official match in six months because of an irregular heartbeat, teamed with Blake to beat Spaniards David Marrero and Fernando Verdasco 6-4, 6-4 in the first round of doubles. Blake and Fish are wild cards. Fish is scheduled to play the first singles match of his comeback today against qualifier Bobby Reynolds, another American in his 30s, today in the second round. Fish, seeded 32nd, received a first-round bye. Texas-Arlington def. Sacramento State 4-3 in Sacramento. No. 1 singles: Marek Marksoo (SS) def. Yauheni Yakauleu 7-6 (3), 6-3. Records: Texas-Arlington 4-4, Sac State 3-8. Sacramento State def. Northern Arizona 4-3 in Sacramento: No. 1 singles: Marek Marksoo (SS) def. Shaun Waters 6-4, 6-4. Records: Sac State 4-8, Northern Arizona 2-11. Nevada def. UC Davis 5-2 in Davis. No. 1 singles: Kyle Miller (UCD) def. Victor Ouvrard 7-6, 6-3. Records: Nevada 7-4, UC Davis 6-7. Pacific def. Santa Clara 4-3 in Santa Clara. No. 1 singles: No. 66 John Lamble (SC) def. Alex Golding 6-1, 6-3. Records: Pacific 8-4, Santa Clara 10-5. Boise State def. USF 6-1 in San Francisco. No. 1 singles: No. 30 Andrew Bettles (BSU) def. Thai Tu 7-6 (6), 6-7 (5), 10-6 match tiebreaker. No. 18 Cal def. No. 31 Washington in Berkeley. No. 1 singles: No. 8 Anett Schutting (C) def. No. 124 Andjela Nemcevic 6-1, 6-1. Records: Cal 7-4, Washington 8-5. No. 20 Stanford def. No. 73 Washington State 7-0 at Stanford. No. 1 singles: No. 87 Nicole Gibbs (S) def. Liudmila Vasilieva 6-1, 6-1. Records: Stanford 7-2, Washington State 10-4. No. 66 San Jose State def. Southern Utah 7-0 in San Jose. No. 1 singles: Sebastiani Leon Chao (SJS) def. Olya Kunz 6-1, 6-2. Records: San Jose State 8-4, Southern Utah 2-3. USF def. Northern Arizona 7-0 in San Francisco. No. 1 singles: Andrea Ka (USF) def. Ghizelene Doballah 6-0, 6-0. Records: USF 6-3, Northern Arizona 6-7. Labels: Anderson, Baker, BNP Paribas Open, Indian Wells, Isner, Querrey, U.S.